Fin hardware accommodates many different material options, gauges, and application configurations. Attach to horizontal surfaces for a Privacy Fin Divider on desktops or pony walls, mount vertically to a wall as a banner or decorative element, or mount horizontally on a wall as shelving. Select the appropriate material gauge from 1/2" to 1" for your application. Emphasize the beauty of Chroma with integrated edge lighting in the Fin. 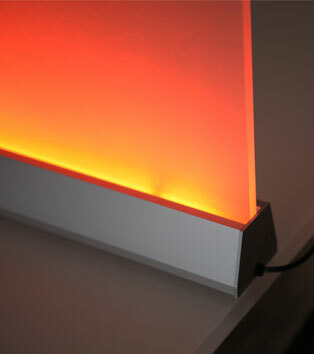 RGB lighting provides color to clear, renewable matte finish Chroma panels. 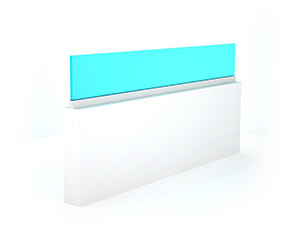 3form Fin hardware has a versatile design that allows mounting to vertical or horiztonal surfaces as wall fins, horizontal privacy partitions on desktops or pony walls, shelving, or even floor-to-ceiling partitions. Based on the material selection the Fin hardware seamlessly integrates with high-powered LED lighting to edge-light the material. Ready to Go solutions are pre-packaged options for creating easy-to-specify partitions, doors, tables and more. Includes material, fabrication, hardware, and CAD drawings. The image above may not necessarily reflect a standard Ready to Go solution, it may have been modified.